Saying yes to almost anything helps us achieve what our customers need to do to get their jobs done especially in museum work. Vertigo Creative of Leicester is a company who produce high quality work for many museums around the country. One such job was at Bewcastle, a former roman medieval fort just north of Hadrians Wall. We produced several items that can be seen in the photos. 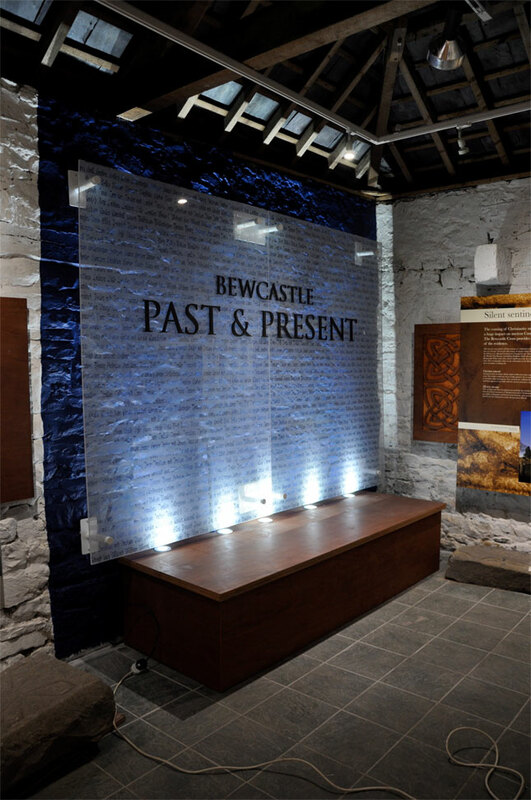 Router cut acrylic letters “Bewcatle past & present” are made from 10mm white acrylic & then wet sprayed a bronze paint colour. Double sided tape is applied to the letter backs for fixing to the customer’s clear acrylic wall. “Pen is mightier than the sword”. Some of our most popular sign makers products are window graphics. We’ve all seen how shop display windows are often utilised to promote products and events, such as sales, but there are other window graphic applications too. 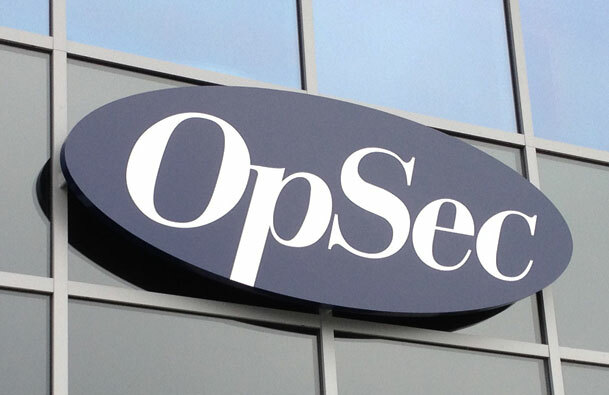 Sign Here’s recent commission by Leicester-based company OpSec Security included such a requirement. As leading Leicester sign makers we attract a lot of local business. 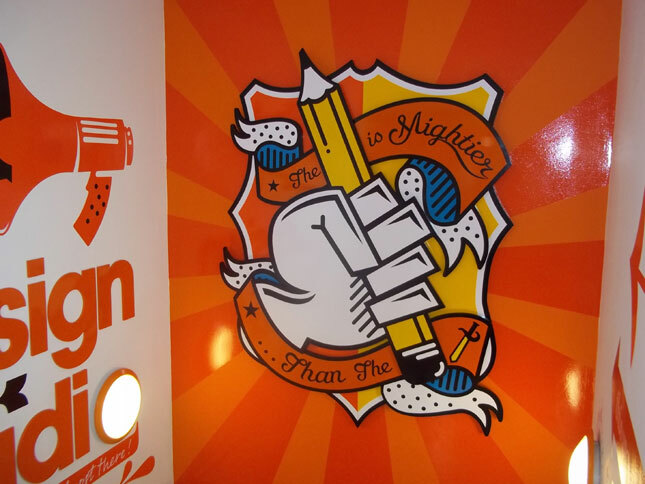 True, we do provide sign making services not only throughout the midlands but also to businesses throughout the UK, but by and large our signage solutions are employed by Leicester-based companies and organisations. 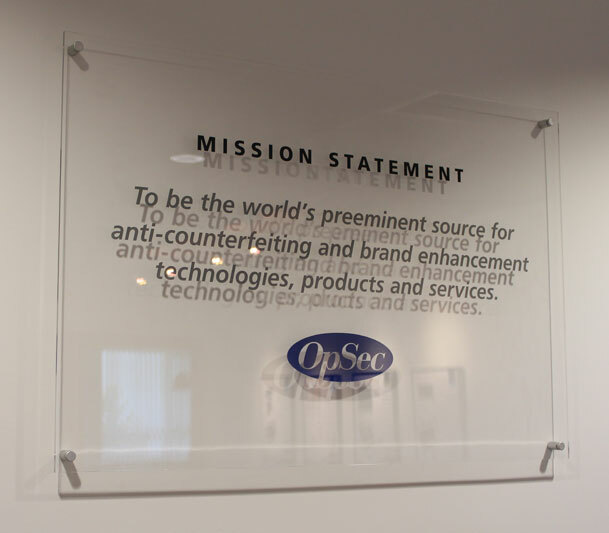 A recent addition to our region is OpSec Security, an American company specialising in anti-piracy and counterfeit protection. Sign makers are only as good as their last job, as far as customers are concerned. Do a job badly and the chances are that customer won’t use you again. Do it right – and by this we mean to expectation, if not beyond, and at great value for money – and the likelyhood is that the customer will come back to you for additional services. 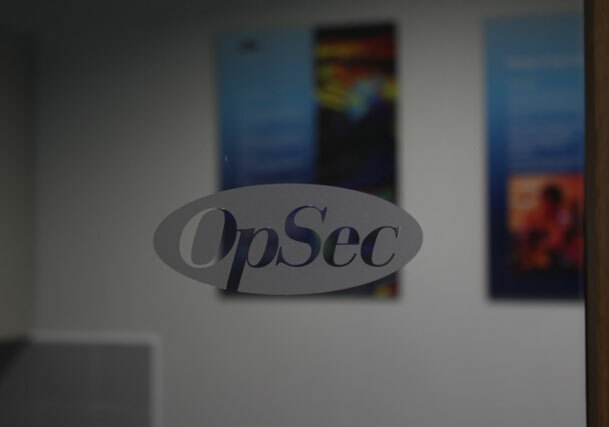 Such is the case with OpSec Security, a leading anti-piracy and counterfeit protection company with offices in Leicester.